Who in the world has ever read a gastronomical crime novel set in medieval Paris? 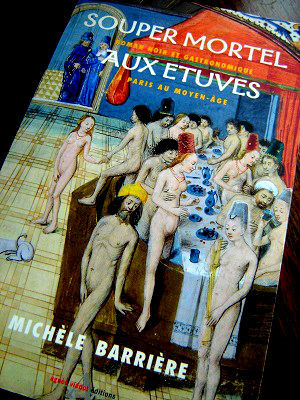 I sure hadn’t, until a friend gave me a copy of Michèle Barrière’s Souper Mortel aux Etuves, or Fatal Dinner at the Steamrooms. The novel begins in the year 1393 with a murder at a brothel disreputable steamroom, right in central Paris. The main character of the novel, Constance, decides to avenge her husband’s murder, so to find out whodunnit, she becomes a cook at the steamrooms, working for the formidable Isabelle la Maquerelle. Besides making a rhyme, Isabelle’s name is a feminine version of maquereau, the French word for the fish called mackerel, but also for mac, as in pimp. When she went to work every day, Constance counted on run-ins with the steamroom’s rough customers, who in typical medieval fashion, would eat with their hands and with the same dagger they’d just used to stab somebody. But what Constance hadn’t bargained for was doing a daily (kitchen) battle with the establishment’s regular chef. During one of their culinary jousts, she meets the famous chef Taillevent. As a gastronomical historian and novelist, Michèle Barrière’s authorial talent is to weave together fact and fiction. For example, you might recognize that Taillevent (real name: Guillaume Tirel) was in fact a real, working chef to kings Charles V and the VI, and he was also the (alleged!) author of the period’s most famous cookbook, Le Viandier. King Charles V loved good food, and he seemed like an all-around pretty good guy: French books refer to him as a “wise and cultivated” king. During his reign in the 14th century, he managed to channel water from a spring in my local neighborhood of Ménilmontant to one of his residences, the hotel Saint Pol in the Marais. If you’ve been to the Marais, you’ll know that the closest metro station to that area of Paris is called Saint Paul, named for just this residence. My personal library doesn’t have 1000 books, but it does have a signed copy of Fatal Dinner at the Steamrooms. 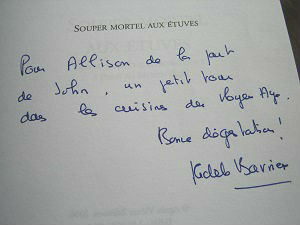 Michèle had inscribed “For Allison, from John: a little spin through a medieval kitchen. Happy tasting!” Recently I had the opportunity to meet Michèle in person near her home in Montmartre, so we decided to go for coffee. Stepping out of her building dressed in construction boots, Michèle held the thick green leash of a beagle, whose leaps into the air and loud barking seemed a little out of the ordinary compared to the subdued Parisian dogs I see politely walking their owners. I guess her beagle thought he was back in Normandy, where Michèle spends a lot of time in summer, hosting medieval cooking weekends and growing her favorite vegetables. Michèle has a noticeable gap in between her two front teeth, which the French refer to as les dents de bonheur or lucky teeth. I suppose I consider Madonna and French singer Vanessa Paradis to be fairly serendipitous people. (Or was that just hard work that made them so successful?) In any case, I love this expression: where most people see a cosmetic flaw to be “repaired” the French consider the tooth gap as lucky! After meeting, we walked down to the corner of her block, where several locals called out hello from the other side of the street: three youngish, handsome guys crossed to greet Michèle, the neighborhood’s local star. She seems to know everyone in this village-like part of Paris, even inside the café, where the other habitués, or regulars, greet her with a hearty Salut Michèle! When I ask Michèle how she came up with the ideas for the books she writes, her face becomes animated and her language is peppered with all sorts of food expressions (there’s one right there…): she says that the idea for her books had been “macerating” for years, soaking in, and that she was “nourished by reflection” about these books after spending time at the Drouot auction house where she came across the occasional old cookbook. She mentioned that the idea for all the books came to her in a flash of inspiration one night, and she immediately set down to write the titles of the first series. Fatal Dinner at the Steamrooms was the first of the Savoisy Dynasty novels, of which there are now 8, and which span the history of eating and art of the table from the 14th century all the way up to the beginning of the 20th century. If you’re wondering what the term “art of the table” means, in French there’s a whole branch of knowledge we call just that: les arts de la table. Glassware, crystal, tablecloths, silverware, porcelain from Sèvres or even just dishes from Monoprix supermarket: you name it! If it goes on a dinner table, the French call it art (of the table). And if you’re interested in crystal, there’s a great exhibit going on at the Petit Palais until January 5th, 2015, all about Baccarat, The Legend of Crystal. But art of the table isn’t the focus of Michèle’s first book, medieval food is. Almost all her novels have a mini-cookbook at the end, so if you’re willing to search for a few exotic ingredients, you can reproduce faithfully the most famous recipes from each historical period. I’ll be the first to admit it: medieval dishes aren’t to everyone’s taste. They’re often what we call sucré-salé in French, or sweet and sour, which many French people I’ve met say they don’t like (as they proceed to tuck in to their pan-sautéed duck breast with cherries). But medieval dishes are indeed exotic to our tame palates: full of spices and acidic flavors that come from flavored vinegars, they also featured citrus fruit or verjuice, the frankly sour juice of unripe grapes. In September, I had the opportunity to try one of those medieval dishes in France’s oldest hostellerie. Nowadays we spell the word in French hôtellerie, but did you know that the little hat symbol (or circumflex) always replaces an “s” in the same word? The hostellerie is just a restaurant nowadays, and it’s in the town of Provins, an hour from Paris. In summertime, this walled city is most well-known for its historical re-enactments and medieval equestrian and falconry shows. Flying raptors aren’t really my thing, but the restaurant sure was: built between 1264 and 1270, around the same time Notre Dame cathedral in Paris was begun, the Hostellerie de la Croix d’Or features a few dishes from the Middle Ages, harkening back to the restaurant’s origins. My sister ordered the chicken brouet with cinnamon and almonds, a dish straight out of Taillevent’s cookbook Le Viandier. Delicious, but odd! But if you’re used to eating them, as Michèle seems to be, dishes from the Middle Ages are “light, tangy, full of color, and easy and quick to make.” If you don’t eat lots of butter and cream, then medieval recipes are for you: sauces were thickened with ground almonds (like the brouet), bread crumbs, or eggs. Not exactly the Paleo diet, but who knows: could the Dagger diet be the next big trend? Easy and quick to make: those words are music to my ears, and definitely apply to the flan recipe below. A flan is really just a kind of custard, and like many medieval recipes, this one contains delicious ground almonds. The only ingredient that might be a little tricky to find is rose syrup, but you can substitute rose water with only a minimum of extra effort. Alright, confession time: I know that some of my other recipes on the web site are more technically challenging, like the Lemon confit and ginger roast veal (which a few of my readers just learned to make with me during one of my Cooking classes), but this flan is super-easy. So I’d love to hear from you: if you liked this article, or tried the recipe, please post a note in the comments section below! 2. In a medium mixing bowl, beat the eggs, egg yolks, and sugar with a whisk. 3. Add the ground almonds, milk, cinnamon, and whisk well. 4. In a small bowl, smash the ricotta with a fork. Add it to the milk mixture along with the rose flavoring. Mix well. 5. Butter a small cake mold (10 x 4½ inches or 25 x 10 cm), or 6-8 individual ramekins. 6. Pour the mixture into the mold, and cook in the oven in a hot water bath for 30 minutes to 1 hour, depending on the size of the mold. The flan is cooked when a knife poked into the middle comes out clean. 7. Let the flan cool completely. Serve either at room temperature or cold. note: I buy rose flavoring gel at my favorite pastry-supply store, G. Detou, in the rue Tiquetonne. If you can find Monin brand rose syrup, great, and if not, rose water will do, but you will have a little excess liquid when the flan is done. Use a paper towel to gently blot and absorb this excess liquid, and your flan will be just as delicious as the original. 1. Préchauffer le four à 150°C. 2. Dans un bol moyen, battre les œufs, les jaunes d’œuf, et le sucre au fouet. 3. Rajouter le poudre d’amandes, le lait, et la cannelle, bien mélanger. 4. Dans un petit bol, écraser la ricotta à la fourchette, et la rajouter au mélange avec le gel de rose (ou l’eau de rose). Bien mélanger le tout. 5. Beurrer un moule à terrine ou à pains. Verser le mélange. 6. Cuire dans un bain-marie d’eau chaude pendant 30 à 45 minutes. Le flan est cuit quand un couteau planté dedans sort « propre » ou sans que ça soit liquide à l’intérieur. 7. Laisser refroidir le flan. Servir tiède ou froid. Si vous avez utilisé de l’eau de rose à la place du gel, il faudrait gentiment absorber l’excès de liquide avec un bout de sopalin, mais ça sera aussi bon !